While physiological loading on lower long bones changes during bone development, the bone cross section either remains circular or slowly changes from nearly circular to other shapes such as oval and roughly triangular. Bone is said to be an optimal structure, where strength is maximized using the optimal distribution of bone mass (also called Wolff’s law). One of the most appropriate mathematical validations of this law would be a structural optimization-based formulation where total strain energy is minimized against a mass and a space constraint. 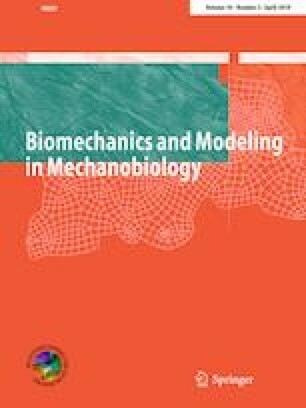 Assuming that the change in cross section during bone development and homeostasis after adulthood is direct result of the change in physiological loading, this work investigates what optimization problem formulation (collectively, design variables, objective function, constraints, loading conditions, etc.) results in mathematically optimal solutions that resemble bones under actual physiological loading. For this purpose, an advanced structural optimization-based computational model for cortical bone development and defect repair is presented. In the optimization problem, overall bone stiffness is maximized first against a mass constraint, and then also against a polar first moment of area constraint that simultaneously constrains both mass and space. The investigation is completed in two stages. The first stage is developmental stage when physiological loading on lower long bones (tibia) is a random combination of axial, bending and torsion. The topology optimization applied to this case with the area moment constraint results into circular and elliptical cross sections similar to that found in growing mouse or human. The second investigation stage is bone homeostasis reached in adulthood when the physiological loading has a fixed pattern. A drill hole defect is applied to the adult mouse bone, which would disrupt the homeostasis. The optimization applied after the defect interestingly brings the damaged section back to the original intact geometry. The results, however, show that cortical bone geometry is optimal for the physiological loading only when there is also a constraint on polar moment of area. Further numerical experiments show that application of torsion along with the gait-analysis-based physiological loading improves the results, which seems to indicate that the cortical bone geometry is optimal for some amount of torsion in addition to the gait-based physiological loading. This work has a potential to be extended to bone growth/development models and fracture healing models, where topology optimization and polar moment of area constraint have not been introduced earlier. Authors acknowledge IIT Ropar for the Institute Fellowship. The authors also acknowledge the computational facilities provided by Science and Engineering Board (SERB), Department of Science and Technology (DST), Government of India via Grant No. SB/S3/MMER/046/2013 and also by Defense Research and Development Organization (DRDO) via Grant No. TBRL/CARS/75/2016.